Peter and I lived together for twenty-five years, more than half of his short life. Within that space of time, together we built networks, fascinating networks of computers, strong networks of friends, two internationally successful businesses and an important and intense side business, a home where two children grew up and many other children and young people found warmth, a bed, frozen pizza, acceptance, support and solidarity. Now I am left to take apart much that we built together by myself. On the surface, there is much that should be simple. Peter and I were a conventional hetero couple, each only married once “until death do us part” with two children. This is actually the norm, the standard against which all other kinds of relationships and ways of living together are measured, the basis for all the relevant laws, regulations and procedures. Somehow, however, it appears now that Peter and I managed to remain true to our shared skepticism about the kind of conventional relationship we lived. Consequently, the process of closing down Peter’s affairs is stymied again and again by the kinds of regulations that are meant to apply to less conventional relationships. I have no access to Peter’s bank accounts, because we always kept our finances separate, so I have to wait for official confirmation that I am indeed the person meant to have access to his bank accounts, his pension, his assets. Since Peter left no will, because that was not something he was ever willing to think about, and since our sons are now legal adults, by default the boys and I are equal inheritors of Peter’s estate. When I realized this meant that every document had to be signed by all three of us, we requested additional documents for the boys to legally grant me the right to sign everything that needs signing by myself. With me in Linz and Paddy and Christopher in Vienna, none of this was simple or quickly accomplished. In the meantime, I have to wait in many cases for notification of bills that have not been paid from Peter’s account, because it is still blocked, and juggle accounts that I do have access to in order to cover them or figure out what needs to be canceled, transferred or deferred. No matter how many times I have to explain to various offices, businesses and services that Peter is dead, it never seems to get any easier, and too many people at the front desk or on the other end of the phone connection have no experience in dealing with a situation like this. Those who do are usually already on the phone elsewhere or in a meeting somewhere and cannot be relied upon to return my calls. Banks, insurance companies, social security offices, phone companies, legal firms: I seem to spend most of my time literally running around in circles from one to the other and back again. These are not the kinds of things I am good at doing, whereas Peter had a real talent for them. Again and again, as I suddenly recall why I have to do this myself, why I can’t just turn it over to Peter and do something else, I find myself standing at a bus stop with tears streaming down my face or unable to explain my questions to the employee at the desk, because sobs are choking my voice. Peter and I have had a server at home almost since we first connected to the Internet, ever since I was first able to explain to Peter what I had learned about email, why it was such an important invention and why we absolutely needed it. In the beginning, it was something we explored together, but as our children grew and started school and I started my own business, I started falling more and more behind and could no longer keep up with everything Peter was learning. Sometimes I resented it and felt compelled to remind him that he could not have developed his skills as he did, had I not been maintaining domestic operations in the background at the same time. Sometimes I was just happy to have access to his special knowledge when I had questions or problems and happy to have a server at home to try things out. The problem now is that I do not have the knowledge and skills to maintain our server by myself. It has to be taken down. “George”, our server, is no longer viable without Peter. How much emotional attachment can one feel for a conglomeration of hardware and software that is a server? Meeting with a group of IT specialists last week to discuss dismantling George, I felt as though my heart would break. Even though it wasn’t evident to anyone who only knew Peter as a skilled and dedicated network administrator, George was something special that Peter and I had shared for many, many years. Letting go is hard. Having to turn George over to a group of men is even harder. I kept wishing that at least some of the Genderchangers could be there to help me – I wanted Donna, Amaia, Amy, Paula, Gloria, Ivana to tell me what to do. But I couldn’t even access Peter’s email without help, because at some point he must have changed his password and forgot to tell me. At least I still have the root password, though. It means more responsibility than comfort, but at least it’s something. My beautiful office is not merely an appendage to Peter’s much more fascinating workshop: I was there first. When we first met, I was living in the room that later became Peter’s office, a space that had been a neglected storage room until I cleared it out and made it a place to live, where Peter later moved in with me. 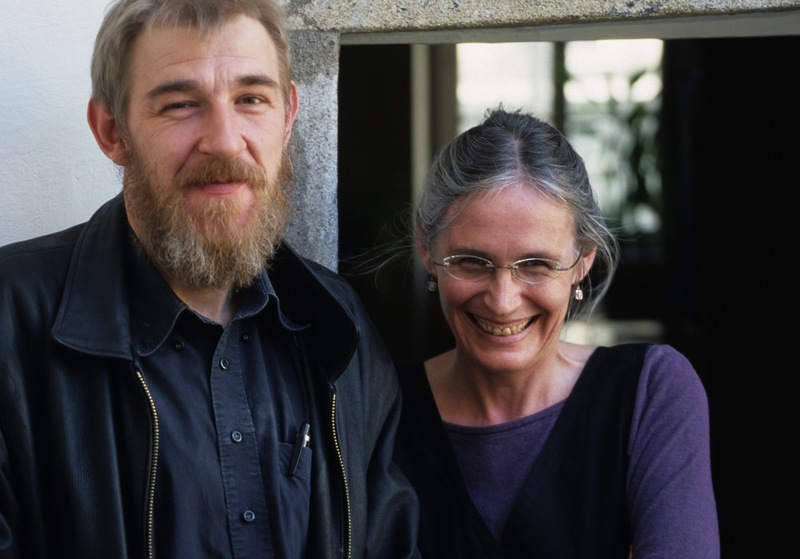 In the beginning, I supported both of us, first with my job as a waitress, then with a job at the university, while Peter was first battling for legal permission to work as an instrument maker in Austria, then setting up his own business. That turned around when Peter’s business started to take off, while I was on maternity leave, receiving only minimal (later sub-minimal) government maternity leave support. As happy as I was for Peter’s success, it was not a situation that I ever felt comfortable or secure with. When Peter turned thirty, he jokingly said, “Now I’m thirty, married with two kids, a home owner and a business owner: this is not the life I envisioned for myself when I was eighteen.” Shortly after that, he suffered a slipped disc. As I watched him being carried out on a stretcher, in so much pain that he was barely conscious, I stood there with a tiny baby running an alarmingly high fever in my arms, trying to contain a toddler climbing the walls, and I was terrified. There was no way of knowing how long Peter might be in hospital, whether he might ever be able to work again, so I had no idea how we might survive. As the ambulance took him away to the hospital, I solemnly swore to myself that I would escape that situation of dependency and never let it happen again. For my own security and the sake of my children, I absolutely needed to be certain that I would always be able to support myself and my children alone, should the need arise. I’m not sure that Peter really understood my deep-rooted fear of dependency. I think sometimes he misinterpreted it as a lack of confidence in him and redoubled his efforts to prove that he could provide for his family. Perhaps we were both right in the end. The Ehrenletzberger House, the 500-year-old building in the main square of Linz, has been part of my life since I first came to Linz in 1985. It was part of Peter’s life from the time he first met me a year later. In that space, we shared dreams and fears, conflicts and excitement, we worked, looked for one another, had long discussions, conversations with friends, found names for our children. Peter’s workshop has become something of a legend throughout the international early music world and locally as well, a subject of beautiful photographs and a place of music and encounters. In the midst of the dust and wood shavings, tiny planes, molds and varnish, beautiful instruments were made that are being played now all over the world. The music remains, but the workshop has to be dismantled now. This was my life too, and taking it apart to make room for what may happen in this space in the future is so very, very painful. What will be left then for me? Peter and I lived together for twenty-five years. At the moment it feels as though it will take that long again to take all the things apart that I cannot continue alone. I can only cling to the conviction that something of the life we shared will still be left for me when it’s done. Dieser Beitrag wurde unter Aileen, Peter, work veröffentlicht. Setze ein Lesezeichen auf den Permalink.